The olive, known by the botanical name Olea europaea, meaning "European olive", is a species of small tree in the family Oleaceae, found in the Mediterranean Basin from Portugal to the Levant, the Arabian Peninsula, and southern Asia as far east as China, as well as the Canary Islands and Réunion. The species is cultivated in many places and considered naturalized in all the countries of the Mediterranean coast, as well as in Argentina, Saudi Arabia, Java, Norfolk Island, California, and Bermuda. Olea europaea is the type species for the genus Olea. The olive's fruit, also called the olive, is of major agricultural importance in the Mediterranean region as the source of olive oil; it is one of the core ingredients in Mediterranean cuisine. The tree and its fruit give their name to the plant family, which also includes species such as lilacs, jasmine, Forsythia, and the true ash trees (Fraxinus). The word "olive" derives from Latin ŏlīva ("olive fruit", "olive tree"), possibly through Etruscan 𐌄𐌋𐌄𐌉𐌅𐌀 (eleiva) from the archaic Proto-Greek form *ἐλαίϝα (*elaíwa) (Classic Greek ἐλαία elaía, "olive fruit", "olive tree"). The word "oil" originally meant "olive oil", from ŏlĕum, ἔλαιον (élaion, "olive oil"). Also in multiple other languages the word for "oil" ultimately derives from the name of this tree and its fruit. The oldest attested forms of the Greek words are the Mycenaean 𐀁𐀨𐀷, e-ra-wa, and 𐀁𐀨𐀺, e-ra-wo or 𐀁𐁉𐀺, e-rai-wo, written in the Linear B syllabic script. The olive tree, Olea europaea, is an evergreen tree or shrub native to the Mediterranean, Asia, and Africa. It is short and squat, and rarely exceeds 8–15 m (26–49 ft) in height. 'Pisciottana', a unique variety comprising 40,000 trees found only in the area around Pisciotta in the Campania region of southern Italy often exceeds this, with correspondingly large trunk diameters. The silvery green leaves are oblong, measuring 4–10 cm (1.6–3.9 in) long and 1–3 cm (0.39–1.18 in) wide. The trunk is typically gnarled and twisted. The small, white, feathery flowers, with ten-cleft calyx and corolla, two stamens, and bifid stigma, are borne generally on the previous year's wood, in racemes springing from the axils of the leaves. The fruit is a small drupe 1–2.5 cm (0.39–0.98 in) long, thinner-fleshed and smaller in wild plants than in orchard cultivars. Olives are harvested in the green to purple stage. Canned black olives have often been artificially blackened (see below on processing) and may contain the chemical ferrous gluconate to improve the appearance. Olea europaea contains a seed commonly referred to in American English as a pit or a rock, and in British English as a stone. Olea europaea subsp. europaea var. sylvestris, considered the "wild" olive of the Mediterranean, is a variety characterized by a smaller tree bearing noticeably smaller fruit. The subspecies O. e. maroccana and O. e. cerasiformis are respectively hexaploid and tetraploid. The trees referred to as white and black olives in Southeast Asia are not actually olives, but species of Canarium. Hundreds of cultivars of the olive tree are known. An olive's cultivar has a significant impact on its colour, size, shape, and growth characteristics, as well as the qualities of olive oil. Olive cultivars may be used primarily for oil, eating, or both. Olives cultivated for consumption are generally referred to as table olives. Since many olive cultivars are self-sterile or nearly so, they are generally planted in pairs with a single primary cultivar and a secondary cultivar selected for its ability to fertilize the primary one. In recent times, efforts have been directed at producing hybrid cultivars with qualities useful to farmers, such as resistance to disease, quick growth, and larger or more consistent crops. Fossil evidence indicates the olive tree had its origins some 20–40 million years ago in the Oligocene, in what is now corresponding to Italy and the eastern Mediterranean Basin. The olive plant later was first cultivated some 7,000 years ago in Mediterranean regions. The edible olive seems to have coexisted with humans for about 5,000 to 6,000 years, going back to the early Bronze Age (3150 to 1200 BC). Its origin can be traced to the Levant based on written tablets, olive pits, and wood fragments found in ancient tombs. The immediate ancestry of the cultivated olive is unknown. Fossil Olea pollen has been found in Macedonia and other places around the Mediterranean, indicating that this genus is an original element of the Mediterranean flora. Fossilized leaves of Olea were found in the palaeosols of the volcanic Greek island of Santorini (Thera) and were dated about 37,000 BP. Imprints of larvae of olive whitefly Aleurolobus (Aleurodes) olivinus were found on the leaves. The same insect is commonly found today on olive leaves, showing that the plant-animal co-evolutionary relations have not changed since that time. Other leaves found on the same island are dated back to 60,000 BP, making them the oldest known olives from the Mediterranean. Olives are not native to the Americas. Spanish colonists brought the olive to the New World, where its cultivation prospered in present-day Peru and Chile. The first seedlings from Spain were planted in Lima by Antonio de Rivera in 1560. Olive tree cultivation quickly spread along the valleys of South America's dry Pacific coast where the climate was similar to the Mediterranean. Spanish missionaries established the tree in the 18th century in California. It was first cultivated at Mission San Diego de Alcalá in 1769 or later around 1795. Orchards were started at other missions, but in 1838, an inspection found only two olive orchards in California. Cultivation for oil gradually became a highly successful commercial venture from the 1860s onward. In Japan, the first successful planting of olive trees happened in 1908 on Shodo Island, which became the cradle of olive cultivation. An estimated 865 million olive trees are in the world today (as of 2005), and the vast majority of these are found in Mediterranean countries, with traditionally marginal areas accounting for no more than 25% of olive-planted area and 10% of oil production. The olive tree is one of the first plants mentioned in the Hebrew Bible (the Christian Old Testament), and one of the most significant. An olive branch (or leaf, depending on translation) was brought back to Noah by a dove to demonstrate that the flood was over (Book of Genesis, 8:11). The olive is listed in Deuteronomy 8:8 as one of the seven species that are noteworthy products of the Land of Israel. The ancient Greeks smeared olive oil on their bodies and hair as a matter of grooming and good health. Olive oil was used to anoint kings and athletes in ancient Greece. It was burnt in the sacred lamps of temples and was the "eternal flame" of the original Olympic games. Victors in these games were crowned with its leaves. In Homer's Odyssey, Odysseus crawls beneath two shoots of olive that grow from a single stock, and in the Iliad, (XVII.53ff) is a metaphoric description of a lone olive tree in the mountains, by a spring; the Greeks observed that the olive rarely thrives at a distance from the sea, which in Greece invariably means up mountain slopes. Greek myth attributed to the primordial culture-hero Aristaeus the understanding of olive husbandry, along with cheese-making and bee-keeping. Olive was one of the woods used to fashion the most primitive Greek cult figures, called xoana, referring to their wooden material; they were reverently preserved for centuries. It was purely a matter of local pride that the Athenians claimed that the olive grew first in Athens. In an archaic Athenian foundation myth, Athena won the patronage of Attica from Poseidon with the gift of the olive. According to the fourth-century BC father of botany, Theophrastus, olive trees ordinarily attained an age around 200 years, he mentions that the very olive tree of Athena still grew on the Acropolis; it was still to be seen there in the second century AD; and when Pausanias was shown it, c. 170 AD, he reported "Legend also says that when the Persians fired Athens the olive was burnt down, but on the very day it was burnt it grew again to the height of two cubits." Indeed, olive suckers sprout readily from the stump, and the great age of some existing olive trees shows that it was perfectly possible that the olive tree of the Acropolis dated to the Bronze Age. The olive was sacred to Athena and appeared on the Athenian coinage. Theophrastus, in On the Causes of Plants, does not give as systematic and detailed an account of olive husbandry as he does of the vine, but he makes clear (in 1.16.10) that the cultivated olive must be vegetatively propagated; indeed, the pits give rise to thorny, wild-type olives, spread far and wide by birds. Theophrastus reports how the bearing olive can be grafted on the wild olive, for which the Greeks had a separate name, kotinos. In his Enquiry into Plants (2.1.2–4) he states that the olive can be propagated from a piece of the trunk, the root, a twig, or a stake. According to Pliny the Elder, a vine, a fig tree, and an olive tree grew in the middle of the Roman Forum; the latter was planted to provide shade (the garden plot was recreated in the 20th century). The Roman poet Horace mentions it in reference to his own diet, which he describes as very simple: "As for me, olives, endives, and smooth mallows provide sustenance." Lord Monboddo comments on the olive in 1779 as one of the foods preferred by the ancients and as one of the most perfect foods. The Mount of Olives east of Jerusalem is mentioned several times in the New Testament. The Allegory of the Olive Tree in St. Paul's Epistle to the Romans refers to the scattering and gathering of Israel. It compares the Israelites to a tame olive tree and the Gentiles to a wild olive branch. The olive tree itself, as well as olive oil and olives, play an important role in the Bible. The olive tree and olive oil are mentioned seven times in the Quran, and the olive is praised as a precious fruit. Olive tree and olive-oil health benefits have been propounded in Prophetic medicine. Muhammad is reported to have said: "Take oil of olive and massage with it – it is a blessed tree" (Sunan al-Darimi, 69:103). Olive trees in the groves around the Mediterranean Sea are centuries old, with some dated to 2000 years. The olive tree on the island of Brijuni (Brioni), Istria in Croatia, has a radiocarbon dating age of about 1,600 years. It still gives fruit (about 30 kg or 66 lb per year), which is made into olive oil. An olive tree in west Athens, named "Plato's Olive Tree", is thought to be a remnant of the grove where Plato's Academy was situated, making it an estimated 2,400 years old. The tree comprised a cavernous trunk from which a few branches were still sprouting in 1975, when a traffic accident caused a bus to uproot it. Following that, the trunk was preserved and displayed in the nearby Agricultural University of Athens. In 2013, it was reported that the remaining part of the trunk was uprooted and stolen, allegedly to serve as firewood. A supposedly older tree, the "Peisistratos Tree", is located by the banks of the Cephisus River, in the municipality of Agioi Anargyroi, and is said to be a remnant of an olive grove that was planted by Athenian tyrant Peisistratos in the sixth century BC. Numerous ancient olive trees also exist near Pelion in Greece. The age of an olive tree in Crete, the Finix Olive, is claimed to be over 2,000 years old; this estimate is based on archaeological evidence around the tree. The olive tree of Vouves, also in Crete, has an age estimated between 2000 and 4000 years. An olive tree called Farga d'Arió in Ulldecona, Catalonia, Spain, has been estimated (with laser-perimetry methods) to date back to 314 CE, which would mean that it was planted when Constantine the Great was Roman emperor. Some Italian olive trees are believed to date back to Ancient Rome (8th century BC to 5th century AD), although identifying progenitor trees in ancient sources is difficult. Several other trees of about 1,000 years old are within the same garden. The 15th-century trees of Olivo della Linza, at Alliste in the Province of Lecce in Apulia on the Italian mainland, were noted by Bishop Ludovico de Pennis during his pastoral visit to the Diocese of Nardò-Gallipoli in 1452. Throughout Israel and Palestine, dozens of ancient olive trees are found with estimated ages of 1,600–2,000 years; however, these estimates could not be supported by current scientific practices. Ancient trees include two giant olive trees in Arraba and five trees in Deir Hanna, both in the Galilee region, which have been determined to be over 3,000 years old, although no available data support the credibility of the study that produced these age estimates, and as such, the 3000 years age estimate can not be considered valid. All seven trees continue to produce olives. Several trees in the Garden of Gethsemane (from the Hebrew words gat shemanim or olive press) in Jerusalem are claimed to date back to the purported time of Jesus. A study conducted by the National Research Council of Italy in 2012 used carbon dating on older parts of the trunks of three trees from Gethsemane and came up with the dates of 1092, 1166, and 1198 AD, while DNA tests show that the trees were originally planted from the same parent plant. According to molecular analysis, the tested trees showed the same allelic profile at all microsatellite loci analyzed which furthermore may indicate attempt to keep the lineage of an older species intact. However, Bernabei writes, "All the tree trunks are hollow inside so that the central, older wood is missing . . . In the end, only three from a total of eight olive trees could be successfully dated. The dated ancient olive trees do, however, not allow any hypothesis to be made with regard to the age of the remaining five giant olive trees." Babcox concludes, "The roots of the eight oldest trees are possibly much older. Visiting guides to the garden often state that they are two thousand years old." The 2,000-year-old Bidni olive trees on the island of Malta, which have been confirmed through carbon dating, have been protected since 1933, and are also listed in UNESCO's Database of National Cultural Heritage Laws. In 2011, after recognising their historical and landscape value, and in recognition of the fact that "only 20 trees remain from 40 at the beginning of the 20th century", Maltese authorities declared the ancient Bidni olive grove at Bidnija, limits of Mosta, as a Tree Protected Area, in accordance with the provisions of the Trees and Woodlands Protection Regulations, 2011, as per Government Notice number 473/11. Green olives are picked when they have obtained full size, but before the ripening cycle has begun; they are usually shades of green to yellow. Semiripe or turning-colour olives are picked at the beginning of the ripening cycle, when the colour has begun to change from green to multicolour shades of red to brown. Only the skin is coloured, as the flesh of the fruit lacks pigmentation at this stage, unlike that of ripe olives. Black olives or ripe olives are picked at full maturity when fully ripe. They are found in assorted shades of purple to brown to black. An olive vat room used for curing at Graber Olive House. 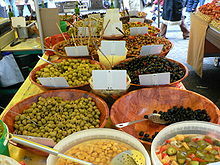 Raw or fresh olives are naturally very bitter; to make them palatable, olives must be cured and fermented, thereby removing oleuropein, a bitter phenolic compound that can reach levels of 14% of dry matter in young olives. In addition to oleuropein, other phenolic compounds render freshly picked olives unpalatable and must also be removed or lowered in quantity through curing and fermentation. Generally speaking, phenolics reach their peak in young fruit and are converted as the fruit matures. Once ripening occurs, the levels of phenolics sharply decline through their conversion to other organic products which render some cultivars edible immediately. One example of an edible olive native to the island of Thasos is the throubes black olive, which when allowed to ripen in the sun, shrivel, and fall from the tree, is edible. The curing process may take from a few days, with lye, to a few months with brine or salt packing. With the exception of California style and salt-cured olives, all methods of curing involve a major fermentation involving bacteria and yeast that is of equal importance to the final table olive product. Traditional cures, using the natural microflora on the fruit to induce fermentation, lead to two important outcomes: the leaching out and breakdown of oleuropein and other unpalatable phenolic compounds, and the generation of favourable metabolites from bacteria and yeast, such as organic acids, probiotics, glycerol, and esters, which affect the sensory properties of the final table olives. Mixed bacterial/yeast olive fermentations may have probiotic qualities. Lactic acid is the most important metabolite, as it lowers the pH, acting as a natural preservative against the growth of unwanted pathogenic species. The result is table olives which can be stored without refrigeration. Fermentations dominated by lactic acid bacteria are, therefore, the most suitable method of curing olives. Yeast-dominated fermentations produce a different suite of metabolites which provide poorer preservation, so they are corrected with an acid such as citric acid in the final processing stage to provide microbial stability. Spanish or Sevillian type (olives with fermentation): Most commonly applied to green olive preparation, around 60% of all the world's table olives are produced with this method. Olives are soaked in lye (dilute NaOH, 2–4%) for 8–10 hours to hydrolyse the oleuropein. They are usually considered "treated" when the lye has penetrated two-thirds of the way into the fruit. They are then washed once or several times in water to remove the caustic solution and transferred to fermenting vessels full of brine at typical concentrations of 8–12% NaCl. The brine is changed on a regular basis to help remove the phenolic compounds. Fermentation is carried out by the natural microbiota present on the olives that survive the lye treatment process. Many organisms are involved, usually reflecting the local conditions or "Terroir" of the olives. During a typical fermentation gram-negative enterobacteria flourish in small numbers at first, but are rapidly outgrown by lactic acid bacteria species such as Leuconostoc mesenteroides, Lactobacillus plantarum, Lactobacillus brevis and Pediococcus damnosus. These bacteria produce lactic acid to help lower the pH of the brine and therefore stabilize the product against unwanted pathogenic species. A diversity of yeasts then accumulate in sufficient numbers to help complete the fermentation alongside the lactic acid bacteria. Yeasts commonly mentioned include the teleomorphs Pichia anomala, Pichia membranifaciens, Debaryomyces hansenii and Kluyveromyces marxianus. Once fermented, the olives are placed in fresh brine and acid corrected, to be ready for market. Sicilian or Greek type (olives with fermentation): Applied to green, semiripe and ripe olives, they are almost identical to the Spanish type fermentation process, but the lye treatment process is skipped and the olives are placed directly in fermentation vessels full of brine (8–12% NaCl). The brine is changed on a regular basis to help remove the phenolic compounds. As the caustic treatment is avoided, lactic acid bacteria are only present in similar numbers to yeast and appear to be outcompeted by the abundant yeasts found on untreated olives. As very little acid is produced by the yeast fermentation, lactic, acetic, or citric acid is often added to the fermentation stage to stabilize the process. 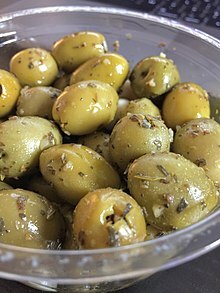 Picholine or directly-brined type (olives with fermentation): Applied to green, semiripe, or ripe olives, they are soaked in lye typically for longer periods than Spanish style (e.g. 10–72 hours) until the solution has penetrated three-quarters of the way into the fruit. They are then washed and immediately brined and acid corrected with citric acid to achieve microbial stability. Fermentation still occurs carried out by acidogenic yeast and bacteria, but is more subdued than other methods. The brine is changed on a regular basis to help remove the phenolic compounds and a series of progressively stronger concentrations of salt are added until the product is fully stabilized and ready to be eaten. Water-cured type (olives with fermentation): Applied to green, semiripe, or ripe olives, these are soaked in water or weak brine and this solution is changed on a daily basis for 10–14 days. The oleuropein is naturally dissolved and leached into the water and removed during a continual soak-wash cycle. Fermentation takes place during the water treatment stage and involves a mixed yeast/bacteria ecosystem. Sometimes, the olives are lightly cracked with a hammer or a stone to trigger fermentation and speed up the fermentation process. Once debittered, the olives are brined to concentrations of 8–12% NaCl and acid corrected, and are then ready to eat. Salt-cured type (olives with minor fermentation): Applied only to ripe olives, they are usually produced in Morocco, Turkey, and other eastern Mediterranean countries. Once picked, the olives are vigorously washed and packed in alternating layers with salt. The high concentrations of salt draw the moisture out of olives, dehydrating and shriveling them until they look somewhat analogous to a raisin. Once packed in salt, fermentation is minimal and only initiated by the most halophilic yeast species such as Debaryomyces hansenii. Once cured, they are sold in their natural state without any additives. So-called Oil-cured olives are cured in salt, and then soaked in oil. California or "artificial ripening" type (olives without fermentation): Applied to green and semiripe olives, they are placed in lye and soaked. Upon their removal, they are washed in water injected with compressed air. This process is repeated several times until both oxygen and lye have soaked through to the pit. The repeated, saturated exposure to air oxidises the skin and flesh of the fruit, turning it black in an artificial process that mimics natural ripening. Once fully oxidised or "blackened", they are brined and acid corrected and are then ready for eating. Olive wood is very hard and is prized for its durability, colour, high combustion temperature, and interesting grain patterns. Because of the commercial importance of the fruit, and the slow growth and relatively small size of the tree, olive wood and its products are relatively expensive. Common uses of the wood include: kitchen utensils, carved wooden bowls, cutting boards, fine furniture, and decorative items. In modern landscape design olive trees are frequently used as ornamental features for their distinctively gnarled trunks and silvery gray foliage. Distribution of olive trees over the Mediterranean Basin. The earliest evidence for the domestication of olives comes from the Chalcolithic period archaeological site of Teleilat el Ghassul in what is today modern Jordan. Farmers in ancient times believed that olive trees would not grow well if planted more than a certain distance from the sea; Theophrastus gives 300 stadia (55.6 km or 34.5 mi) as the limit. Modern experience does not always confirm this, and, though showing a preference for the coast, they have long been grown further inland in some areas with suitable climates, particularly in the southwestern Mediterranean (Iberia, northwest Africa) where winters are mild. Olive trees show a marked preference for calcareous soils, flourishing best on limestone slopes and crags, and coastal climate conditions. They grow in any light soil, even on clay if well drained, but in rich soils, they are predisposed to disease and produce poorer oil than in poorer soil. (This was noted by Pliny the Elder.) Olives like hot weather and sunny positions without any shade, while temperatures below −10 °C (14 °F) may injure even a mature tree. They tolerate drought well, due to their sturdy and extensive root systems. Olive trees can live for several centuries and can remain productive for as long if they are pruned correctly and regularly. Only a handful of olive varieties can be used to cross-pollinate. 'Pendolino' olive trees are partially self-fertile, but pollenizers are needed for a large fruit crop. Other compatible olive tree pollenizers include 'Leccino' and 'Maurino'. 'Pendolino' olive trees are used extensively as pollenizers in large olive tree groves. Phenological development of olive flowering, following BBCH standard scale. a-50, b-51, c-54, d-57, (<15% open flowers); f-65, (>15% open flowers); g-67, (<15% open flowers); h-68. Olives are propagated by various methods. The preferred ways are cuttings and layers; the tree roots easily in favourable soil and throws up suckers from the stump when cut down. However, yields from trees grown from suckers or seeds are poor; they must be budded or grafted onto other specimens to do well. Branches of various thickness cut into lengths around 1 m (3.3 ft) planted deeply in manured ground soon vegetate. Shorter pieces are sometimes laid horizontally in shallow trenches and, when covered with a few centimetres of soil, rapidly throw up sucker-like shoots. In Greece, grafting the cultivated tree on the wild tree is a common practice. In Italy, embryonic buds, which form small swellings on the stems, are carefully excised and planted under the soil surface, where they soon form a vigorous shoot. In situations where extreme cold has damaged or killed the olive tree, the rootstock can survive and produce new shoots which in turn become new trees. In this way, olive trees can regenerate themselves. In Tuscany in 1985, a very severe frost destroyed many productive, and aged, olive trees and ruined many farmers' livelihoods. However, new shoots appeared in the spring and, once the dead wood was removed, became the basis for new fruit-producing trees. In this way, an olive tree can live for centuries or even millennia. Olives grow very slowly, and over many years, the trunk can attain a considerable diameter. A. P. de Candolle recorded one exceeding 10 m (33 ft) in girth. The trees rarely exceed 15 m (49 ft) in height, and are generally confined to much more limited dimensions by frequent pruning. Olea europaea is very hardy: drought-, disease- and fire-resistant, it can live to a great age. Its root system is robust and capable of regenerating the tree even if the above-ground structure is destroyed. The older the olive tree, the broader and more gnarled the trunk becomes. Many olive trees in the groves around the Mediterranean are said to be hundreds of years old, while an age of 2,000 years is claimed for a number of individual trees; in some cases, this has been scientifically verified. See paragraph dealing with the topic. The crop from old trees is sometimes enormous, but they seldom bear well two years in succession, and in many cases, a large harvest occurs every sixth or seventh season. Various pathologies can affect olives. The most serious pest is the olive fruit fly (Dacus oleae or Bactrocera oleae) which lays its eggs in the olive most commonly just before it becomes ripe in the autumn. The region surrounding the puncture rots, becomes brown, and takes a bitter taste, making the olive unfit for eating or for oil. For controlling the pest, the practice has been to spray with insecticides (organophosphates, e.g. dimethoate). Classic organic methods have now been applied such as trapping, applying the bacterium Bacillus thuringiensis, and spraying with kaolin. Such methods are obligatory for organic olives. Xylella fastidiosa bacteria, which can also infect citrus fruit and vines, has attacked olive trees in the Lecce province, Salento, Southern Italy causing the olive quick decline syndrome (OQDS). The main vector is Philaenus spumarius (meadow spittlebug). Rabbits eat the bark of olive trees and can do considerable damage, especially to young trees. If the bark is removed around the entire circumference of a tree, it is likely to die. Voles and mice also do damage by eating the roots of olives. Since its first domestication, O. europaea has been spreading back to the wild from planted groves. 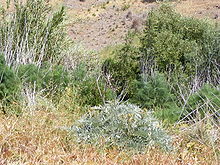 Its original wild populations in southern Europe have been largely swamped by feral plants. In some other parts of the world where it has been introduced, most notably South Australia, the olive has become a major woody weed that displaces native vegetation. In South Australia, its seeds are spread by the introduced red fox and by many bird species, including the European starling and the native emu, into woodlands, where they germinate and eventually form a dense canopy that prevents regeneration of native trees. As the climate of South Australia is very dry and bushfire prone, the oil-rich feral olive tree substantially increases the fire hazard of native sclerophyll woodlands. Most olives today are harvested by shaking the boughs or the whole tree. Using olives found lying on the ground can result in poor quality oil, due to damage. Another method involves standing on a ladder and "milking" the olives into a sack tied around the harvester's waist. This method produces high quality oil. A third method uses a device called an oli-net that wraps around the tree trunk and opens to form an umbrella-like catcher from which workers collect the fruit. Another method uses an electric tool, the oliviera, that has large tongs that spin around quickly, removing fruit from the tree. Olives harvested by this method are used for oil. Olives are one of the most extensively cultivated fruit crops in the world. In 2011, about 9.6 million hectares (24 million acres) were planted with olive trees, which is more than twice the amount of land devoted to apples, bananas, or mangoes. Only coconut trees and oil palms command more space. Cultivation area tripled from 2.6 to 7.95 million hectares (6.4 to 19.6 million acres) between 1960 and 1998 and reached a peak of 10 million hectares (25 million acres) in 2008. The 10 largest producing countries, according to the Food and Agriculture Organization, are all located in the Mediterranean region and produce 95% of the world's olives. One hundred grams of cured green olives provide 146 calories, are a rich source of vitamin E (25% of the Daily Value, DV), and contain a large amount of sodium (104% DV); other nutrients are insignificant. Green olives are 75% water, 15% fat, 4% carbohydrates and 1% protein (table). The polyphenol composition of olive fruits varies during fruit ripening and during processing by fermentation when olives are immersed whole in brine or crushed to produce oil. In raw fruit, total polyphenol contents, as measured by the Folin method, are 117 mg/100 g in black olives and 161 mg/100 g in green olives, compared to 55 and 21 mg/100 g for extra virgin and virgin olive oil, respectively. Olive fruit contains several types of polyphenols, mainly tyrosols, phenolic acids, flavonols and flavones, and for black olives, anthocyanins. The main bitter flavor of olives before curing results from oleuropein and its aglycone which total in content, respectively, 72 and 82 mg/100 g in black olives, and 56 and 59 mg/100 g in green olives. During the crushing, kneading and extraction of olive fruit to obtain olive oil, oleuropein, demethyloleuropein and ligstroside are hydrolyzed by endogenous beta-glucosidases to form aldehydic aglycones. 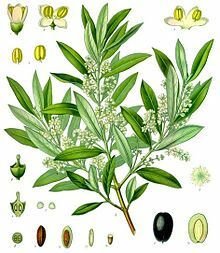 Olive tree pollen is extremely allergenic, with an OPALS allergy scale rating of 10 out of 10. Olea europaea is primarily wind-pollinated, and their light, buoyant pollen is a strong trigger for asthma. One popular variety, "Swan Hill", is widely sold as an "allergy-free" olive tree; however, this variety does bloom and produce allergenic pollen. ^ "Kew World Checklist of Selected Plant Families, Olea europaea". Royal Botanic Gardens, Kew. Retrieved December 5, 2014. ^ "Olea europaea (map)". Biota of North America Program. Retrieved December 5, 2014. ^ oliva. Charlton T. Lewis and Charles Short. A Latin Dictionary on Perseus Project. ^ Ernout & Meillet s.v. oleum. ^ "Mycenaean (Linear b) – English Glossary" (PDF). www.explorecrete.com. ^ "The Linear B word e-ra-wa". "The Linear B word e-ra-wo". Palaeolexicon. Word study tool of ancient languages. "e-ra3-wo". Raymoure, K.A. "e-ra-wo". Minoan Linear A & Mycenaean Linear B. Deaditerranean. ^ Eddo Rugini; Luciana Baldoni; Rosario Muleo; Luca Sebastiani (2016). The Olive Tree Genome. Springer. p. 14. ISBN 978-3-319-48887-5. ^ Jozef M. Pacyna and Elisabeth G. Pacyna (2016). Environmental Determinants of Human Health. Springer. p. 107. ISBN 978-3-319-43142-0. ^ Susan Featherstone (2015). A Complete Course in Canning and Related Processes: Volume 3 Processing Procedures for Canned Food Products. Woodhead Publishing. p. 113. ISBN 978-0-85709-687-6. ^ Green PS (2002). "A revision of Olea L. (Oleaceae)". Kew Bulletin. 57 (1): 91–140. doi:10.2307/4110824. JSTOR 4110824. ^ Besnard G, Rubio de Casas R, Christin PA, Vargas P (2009). "Phylogenetics of Olea (Oleaceae) based on plastid and nuclear ribosomal DNA sequences: Tertiary climatic shifts and lineage differentiation times". Annals of Botany. 104 (1): 143–60. doi:10.1093/aob/mcp105. PMC 2706730. PMID 19465750. ^ Besnard G, Garcia-Verdugo C, Rubio de Casas R, Treier UA, Galland N, Vargas P (2008). "Polyploidy in the Olive Complex (Olea europaea): Evidence from Flow Cytometry and Nuclear Microsatellite Analyses". Annals of Botany. 101 (1): 25–30. doi:10.1093/aob/mcm275. PMC 2701839. PMID 18024415. ^ "Buah Ca-na, Chinese White Olive". Singapore National Parks Board. Retrieved 2019-02-14. ^ Lanza, Fabrizia (15 March 2012). Olive: A Global History. Reaktion Books. pp. 106–110. ISBN 978-1-86189-972-9. ^ a b c d e Garrido Fernandez, A.; Fernandez-Diez, M.J.; Adams, M.R. (31 July 1997). Table Olives: Production and Processing. Springer. pp. 23–45. ISBN 978-0-412-71810-6. ^ a b Boskou, D., ed. (1996). Olive Oil. Chemistry and Technology. AOCS Press. ^ Therios, Ioannis Nikolaos (2009). Olives: Volume 18 of Crop Production Science in Horticulture (History of Olive Growing, page 1). CABI. ISBN 978-1-84593-620-4. ^ Di Giovacchino, Luciano (2013). "3". Handbook of Olive Oil: Analysis & Properties (2nd ed.). Springer Science & Business Media New York. p. 57. ^ Vossen, Paul (2007). "Olive Oil: History, Production, and Characteristics of the World's Classic Oils". HortScience. 42 (5): 1093–1100. doi:10.21273/HORTSCI.42.5.1093. ^ Lanza, Fabrizia (2011). Olive: a global history. London: Reaktion Books. p. 15. ISBN 978-1-86189-972-9. ^ Friedrich W.L. (1978) Fossil plants from Weichselian interstadials, Santorini (Greece) II, published in the "Thera and the Aegean World II", London, pp. 109–128. Retrieved on 2011-12-07. ^ "Mediterranean Museums of Olive". www.oliveoilmuseums.gr. Retrieved 2016-05-22. ^ Gooch, Ellen (2005). "10+1 Things you may not know about olive oil". Epikouria Magazine (Fall/Spring). Retrieved December 5, 2014. ^ Crosby, Alfred W. (2003). The Columbian Exchange: Biological and Cultural Consequencies of 1492. Santa Barbara, CA: Praeger. p. 73. ISBN 978-0-27598-092-4. ^ Carter, Nancy Carol (2008). "San Diego Olives: Origins of a California Industry" (PDF). The Journal of San Diego History. 54 (3): 138–140. ^ "Olive Growing and Nursery Production". International Olive Council. Retrieved December 5, 2014. ^ Macdonald, Nathan (2008) What Did the Ancient Israelites Eat?. William B. Eerdmans. pp. 23–24. ISBN 978-0-8028-6298-3. ^ Homer, Odyssey, book 5". 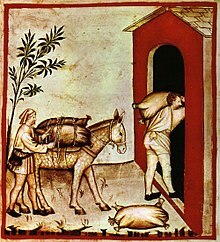 ^ "He learned from the Nymphai how to curdle milk, to make bee-hives, and to cultivate olive-trees, and was the first to instruct men in these matters." (Diodorus Siculus, 4. 81. 1). ^ Toward the end of the 2nd century AD, the traveler Pausanias saw many such archaic cult figures. 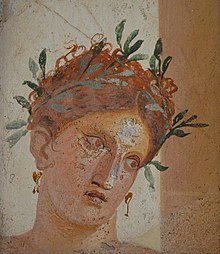 ^ "Indeed it is said that at that [ancient] time there were no olives anywhere save at Athens." (Herodotus, 5. 82. 1 ). ^ Theophrastus, On the Causes of Plants,, 4.13.5., noted by Isager, Signe and Skydsgaard, Jens Erik (1992) Ancient Greek Agriculture, An introduction. Routledge. p. 38. ISBN 0415001641. ^ "...which is still shown in the Pandroseion" (pseudo-Apollodorus, Bibliotheke, 3.14.1). ^ Pausanias, Description of Greece 1. 27. 1. ^ Hort, Sir Arthur (1916). Theophrastus Enquiry into Plants. William Heinemann. p. 107. ^ Hassouna, Viktoria (2010). Virgin Olive Oil. Books on Demand. p. 23. ISBN 978-3839175057. ^ "Olive Leaf Burning". cyprus44.com. ^ "Ancient Olive Tree". Brijuni National Park. Retrieved 27 May 2016. ^ a b Vasilopoulos, Costas (17 January 2013). "Plato's Sacred Olive Tree Vanished". Olive Oil Times. Retrieved 14 October 2017. ^ Koutoudis, Dennis. "The Pelion Estates". Retrieved 2012-11-10. ^ a b Oliver Rackham; Jennifer Alice Moody (1996). The making of the Cretan landscape. Manchester University Press. ISBN 978-0-7190-3647-7. cited in F. R. Riley (2002). "Olive Oil Production on Bronze Age Crete: Nutritional properties, Processing methods, and Storage life of Minoan olive oil". Oxford Journal of Archaeology. 21: 63. doi:10.1111/1468-0092.00149. ^ "Crete Lore". CreteWest.com. Retrieved 14 October 2017. ^ ARA, June 18, 2015. ARA-diari (2015-06-18). Retrieved on 2015-06-20. ^ Al-BAB (August 2011). "Ancient Olive Tree". ^ Drinkwater, Carol (2006). The Olive Route. Weidenfeld & Nicolson. ISBN 978-0-297-84789-2. ^ Reuters (October 20, 2012). "Jerusalem olive trees among oldest in world". Haaretz. ^ Petruccelli, R; Giordano, C; Salvatici, M. C.; Capozzoli, L; Ciaccheri, L; Pazzini, M; Lain, O; Testolin, R; Cimato, A (2014). "Observation of eight ancient olive trees (Olea europaea L.) growing in the Garden of Gethsemane". Comptes Rendus Biologies. 337 (5): 311–7. doi:10.1016/j.crvi.2014.03.002. PMID 24841957. ^ Bernabei, Mauro (2015). "The age of the olive trees in the Garden of Gethsemane". Journal of Archaeological Science. 53: 43–48. doi:10.1016/j.jas.2014.10.011. ^ Babcox, Wendy (2014). "Every Olive Tree in the Garden of Gethsemane". Departures in Critical Qualitative Research. 3 (2): 111–115. doi:10.1525/dcqr.2014.3.2.111. ^ "2,000-year-old Trees still producing olives". The Malta Independent. Retrieved 14 May 2016. ^ "Race to save endemic olive tree intensifies". The Times of Malta. Retrieved 10 August 2016. ^ "List of Historical Trees Having an Antiquarian Importance". Government of Malta. Retrieved 14 May 2016. ^ "List of Historical Trees Having an Antiquarian Importance". UNESCO. Retrieved 14 May 2016. ^ "Rural Development Programme for Malta 2007–2013" (PDF). Ministry for Resources and Rural Affairs. 2009. Retrieved 10 May 2016. ^ "Trees and Woodlands Protection Regulations, 2011" (PDF). The Government of Malta Gazette. 2011. Retrieved 10 May 2016. ^ Renfrew, Colin (1972). The Emergence of Civilization; The Cyclades and the Aegean in the Third Millennium B.C. Taylor & Francis. p. 280. ISBN 9780977409464. ^ Essid, Mohamed Yassine (2012). Chapter 2. History of Mediterranean Food. MediTerra: The Mediterranean Diet for Sustainable Regional Development. Presses de Sciences Po. p. 29. ISBN 9782724612486. ^ a b "About Olives". International Olive Council. Retrieved December 5, 2014. ^ a b c Omar, S. H. (2010). "Oleuropein in olive and its pharmacological effects". Scientia Pharmaceutica. 78 (2): 133–54. doi:10.3797/scipharm.0912-18. PMC 3002804. PMID 21179340. ^ "Throubes". Olives South Africa. Retrieved 2017-03-22. ^ "Eat Like a Man". Esquire. 2010-09-08. Retrieved 22 September 2011. ^ Yada, Sylvia; Harris, Linda. "Olives: Safe Methods for Home Pickling" (PDF). University of California, Division of Agricultural and Natural Resources. Retrieved December 6, 2014. ^ a b c d Kailis, Stanley G., and David John Harris (2007). Producing table olives. Landlinks Press. ^ Bautista-Gallego, J.; Arroyo-López, F.N. ; Rantsiou, K.; Jiménez-Díaz, R.; Garrido-Fernández, A.; Cocolin, L. (2013). "Screening of lactic acid bacteria isolated from fermented table olives with probiotic potential". Food Research International. 50: 135–142. doi:10.1016/j.foodres.2012.10.004. ^ Silva, T.; Reto, M.; Sol, M.; Peito, A.; Peres, C.M. ; Peres, C.; Malcata, F. Xavier (2011). "Characterization of yeasts from Portuguese brined olives, with a focus on their potentially probiotic behavior". LWT - Food Science and Technology. 44 (6): 1349. doi:10.1016/j.lwt.2011.01.029. ^ Botta, C; Cocolin, L (2012). "Microbial dynamics and biodiversity in table olive fermentation: Culture-dependent and -independent approaches". Frontiers in Microbiology. 3: 245. doi:10.3389/fmicb.2012.00245. PMC 3390769. PMID 22783248. ^ University of Catania PhD in Food Science and Technology, Food Microbiology: "Isolation and characterization of yeasts isolated from naturally fermented olives with brine bioprotective function" Laboratory of Food Microbiology, DISPA, Agrarian Faculty. ^ "Oil-Cured Olives: A Kalamata Substitute?". Cooks Illustrated. May 2016. Retrieved 27 November 2016. ^ EDIBLE TREES. AnVi OpenSource Knowledge Trust. 1969. ^ "Genius Garden Ideas: 10 Landscapes with Olive Trees". www.gardenista.com. 2018-07-29. Retrieved 29 July 2018. ^ "First Welsh olive grove planted on Anglesey". Wales Online. 2007-04-30. Retrieved 2011-12-11. ^ (Lewington and Parker, 114). ^ Janse, J. D. (1982). "Pseudomonas syringae subsp. savastanoi (ex Smith) subsp. nov., nom. rev., the bacterium causing excrescences on Oleaceae and Nerium oleander L". Int. J. Syst. Bacteriol. 32 (2): 166–169. doi:10.1099/00207713-32-2-166. ^ "Minimizing the Spread of Disease in Italy's Famous Olive Trees". Our Environment at Berkeley. University of California at Berkeley, Department of Environmental Science, Policy, and Management (ESPM). 9 February 2015. Retrieved 5 May 2015. ^ "Olive tree disease spreads in Italy". BBC News. 2015-03-24. ^ Martelli, G. P; Boscia, D; Porcelli, F; Saponari, M (2015). "The olive quick decline syndrome in south-east Italy: A threatening phytosanitary emergency". European Journal of Plant Pathology. 144 (2): 235–243. doi:10.1007/s10658-015-0784-7. ^ Burr, M. (1999). Australian Olives. A guide for growers and producers of virgin oils, 4th edition. ISBN 0-9577583-0-8. ^ Lumaret, Roselyne; Ouazzani, Noureddine (2001). "Ancient wild olives in Mediterranean forests". Nature. 413 (6857): 700. Bibcode:2001Natur.413..700L. doi:10.1038/35099680. PMID 11607022. ^ Spennemann, D. H. R.; Allen, L. R. (2000). "Feral olives (Olea europaea) as future woody weeds in Australia: a review". Australian Journal of Experimental Agriculture. 40 (6): 889–901. doi:10.1071/EA98141. ^ "Methods for harvesting olive fruit". olivemuseum.com. Retrieved 2 April 2014. ^ a b c "Olives and olive oil". Phenol-Explorer. Retrieved December 5, 2014. ^ a b c Ogren, Thomas (2015). The Allergy-Fighting Garden. Berkeley, CA: Ten Speed Press. p. 159. ISBN 978-1-60774-491-7. ^ Polito, V. "Pollination and Fruit Set" (PDF). Retrieved 12 May 2015. 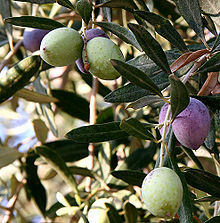 Wikimedia Commons has media related to Olea europaea and Olives. This page was last edited on 7 April 2019, at 17:30 (UTC).